CHICAGO (June 20, 2018) – The Andaz brand announced today its latest collaboration with (RED) – the AIDS organization founded by Bono and Bobby Shriver – the launch of a custom suite at Andaz London Liverpool Street personally designed by Sir Terence Conran, founder of acclaimed architecture and interior design firm, Conran and Partners. The (ANDAZ)RED Suite is available to book beginning June 22, 2018, with a portion of each booking going directly to support (RED)’s fight to end AIDS. Development of the 900 square foot suite (80 square meters) follows a larger renovation of the hotel’s 267 guestrooms in 2017, completed by the team at Conran and Partners. 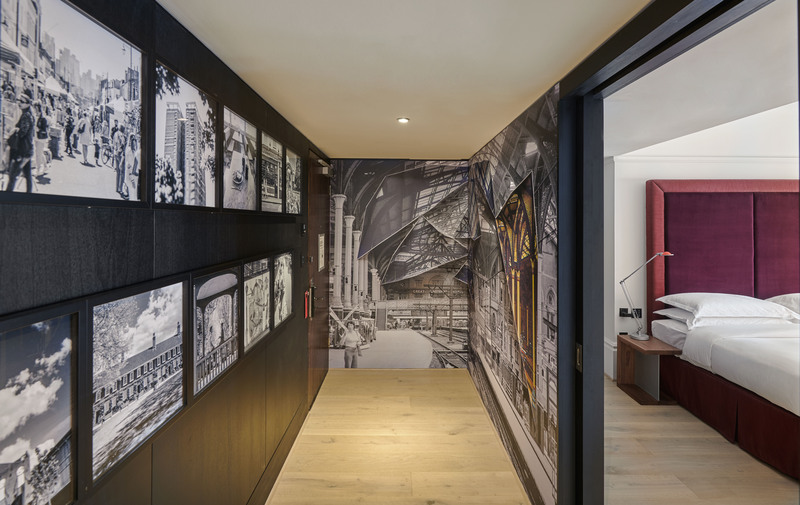 The Andaz brand launched 11 years ago with Andaz London Liverpool Street. 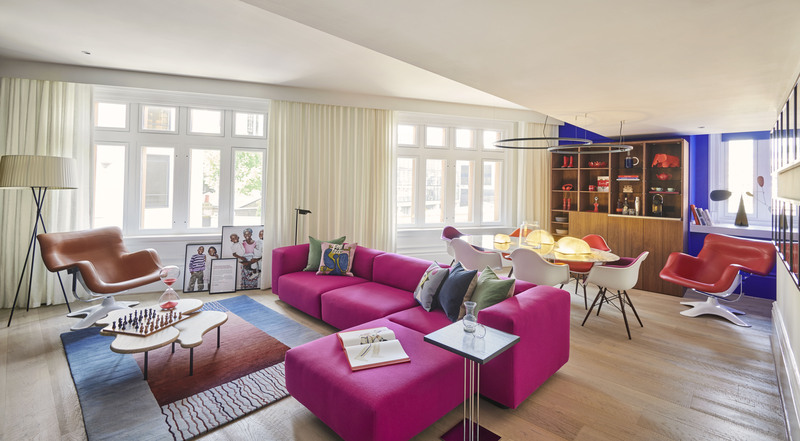 Leveraging the hotel’s largest suite, the design includes custom-made cabinets, bedside and dressing tables, Eames and Karusselli lounge chairs (Sir Terence’s favorite seating) and a replica of the coffee table Sir Terence designed for his own home. The room layout was adjusted to create a living and dining area as well as a separate bedroom, while introducing finishes and furniture to distinctly set it apart from both other hotel experiences in the area and the recently redesigned Andaz rooms. The suite’s bathroom includes black Dornbracht brassware and basins by Laufen. It also houses a double vanity unit in marble, a freestanding Laufen bath and heated floors. The room design also references (RED) with one of the Karuselli chairs upholstered in red leather, a bright magenta sofa, and red glass bedside lamps. The suite will also feature portraits by British portrait and fashion photographer Rankin. Each portrait tells the story of how (RED) funds were put to work on the ground, showcasing mothers and children in Africa who have thrived because of the (RED) funds from partners like the Andaz brand. A special cabinet designed by Sir Terence contains a selection of (RED) products available for purchase ranging from $19-$315 (£14-£300). With each purchase, guests will provide an additional donation to (RED). The selection currently includes: (BEATS)RED Beats Pill+, (ALESSI)RED Anna G Corkscrew, (S’WELL)RED bottle, (LE CREUSET)RED Salt and Pepper Mill, and a (VESPA)RED helmet and mug. As part of the first collaboration of its kind between a hotel brand and (RED), this suite is the latest in a series of activations since 2017, including the first-ever (ANDAZ)RED Suite at Andaz West Hollywood designed by Jonathan Adler; (ANDAZ)RED Cabanas at five Andaz properties worldwide; and a breakfast promotion at Andaz properties in North America to raise funds for (RED)’s fight. The term “Hyatt” is used in this release for convenience to refer to Hyatt Hotels Corporation and /or one or more of its affiliates. Global in scale while local in perspective, Andaz hotels weave the sights, sounds and tastes of their surroundings into each property for an experience that truly immerses guests in the eclectic culture of each local destination. Through personalized, unscripted service, Andaz hotels create a barrier-free environment where guests are encouraged to explore their personal sense of style and become inspired by the spirit of the culture around them. Seventeen Andaz hotels are currently open: Andaz 5th Avenue and Andaz Wall Street in New York, Andaz San Diego, Andaz West Hollywood, Andaz Napa, Andaz Scottsdale Resort and Spa, Andaz Savannah, Andaz Maui at Wailea, Andaz Ottawa Byward Market, Andaz Mayakoba Resort Riviera Maya, Andaz Peninsula Papagayo in Costa Rica, Andaz London Liverpool Street, Andaz Amsterdam Prinsengracht, Andaz Singapore, Andaz Delhi, Andaz Xintiandi in Shanghai, and Andaz Tokyo Toranomon Hills. For more information, please visit andaz.com. Follow @Andaz on Facebook, Twitter and Instagram, and tag photos with #WhenInAndaz. (RED) was founded in 2006 to engage businesses and people in the fight against AIDS. (RED) partners with the world’s most iconic brands that contribute proceeds from (RED)-branded goods and services to the Global Fund. (RED) Proud Partners include: Amazon, Apple, Bank of America, Beats by Dr. Dre, Belvedere, Claro, The Coca-Cola Company, MCM, Salesforce, SAP, Starbucks and Telcel. (RED) Special Edition partners include: aden+anais, Alessi, ALEX AND ANI, Andaz, Baxter of California, Bombas, Fatboy USA, Fully, Girl Skateboards, Le Creuset, Nickelodeon, Mophie, S’well, Wanderlust and Vespa. To date, (RED) has generated more than $500 million for the Global Fund to fight AIDS, Tuberculosis and Malaria, to support HIV/AIDS grants in Ghana, Kenya, Lesotho, Rwanda, South Africa, Swaziland, Tanzania and Zambia. 100 percent of that money goes to work on the ground – no overhead is taken. Global Fund grants that (RED) supports have impacted more than 110 million people with prevention, treatment, counseling, HIV testing and care services.